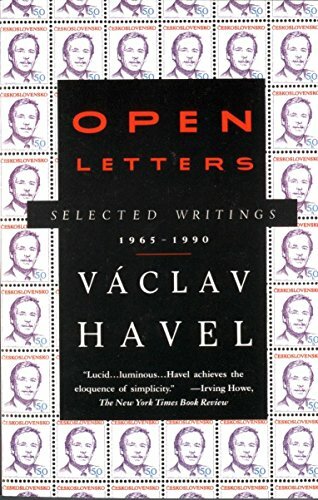 This collection of essays by Vaclav Havel, written in a dry, even deadpan style, testifies to the courage of the playwright, dissident, and first president of independent Czechoslovakia. Havel spoke the truth to tyrants, again and again. His writing influenced not only the Czech independence movement, but those of other Soviet-bloc countries, including Poland's Solidarity movement. These documents dissect the peculiar nature of the totalitarian system Havel lived under, and reveal the train of logic that inspired the dissident movements. I read ten of the 25 pieces in this collection. Of those, two stood out most. So far, you and your government have chosen the easy way out for yourselves, and the most dangerous road for society: the path of inner decay for the sake of outward appearances; of deadening life for the sake of increasing uniformity; of deepening the spiritual and moral crisis of our society, and ceaselessly degrading human dignity, for the puny sake of protecting your own power. When I shop, they now stick so close to me that if they were to slip their arm into mine we'd look like lovers. At the post office, they boldly read my correspondence over my shoulder, and once they snatched the letters out of my hand and recorded the names of my correspondents (not very useful, since most of them only sign with their Christian names). This is, for me, Havel at his most interesting. Harder for me to get through were pieces like "The Power of the Powerless," a very abstract yet very precise description of the peculiar nature of the totalitarian systems of the Soviet bloc countries. He makes a good case that these dictatorships were unlike any others in history. Sadly, writing that is long but not engaging, even if very important, quickly becomes a chore for me to read. There was a lot in this collection for me to love and learn from; anyone interested in the period or in Havel would probably find much of it interesting and enjoyable. *gasp* Essays by Vaclav Havel! Yep, I need those. Yep, you do. :) Don't be put off by my impatience with the longer pieces. This book sounds like it was quite a chore. Review is revealing and love to hear how the book made you feel. A totalitarian system isn't what I want to read about, but it is something I must read about. ( see: Iron Curtain, by Anne Applebaum)if I am to understand the history of the 20th century. Parts of it were a chore, honestly. But not all. I did value getting a detailed picture of life under that sort of system--the oppressiveness of having to guard your very thoughts all the time--ugh. I haven't heard of Applebaum but am off to find her on Amazon. Anne Applebaum is so easy to read. Her book is very well structured and one can read a chapter, leave and come back later. She enriches the history with tidbits of information and possible cross-reads. I discoverd Gyorgy Faludy (see Wikipedia) an ordered his book My Happy Days in Hell. You know, I don't want to give the impression that Open Letters is a difficult read--it's not. My problem was just one of staying engaged. Some of the essays are interesting and moving. Others, though, just read as long, dry, academic treatises.